We’ve seen internet-enabled holiday displays before, and we know IPv6 offers much more space than the older IPv4 addressing scheme that most of us still use today, but the two have never been more spectacularly demonstrated than at jinglepings.com. The live video stream shows an Internet-connected Christmas tree and an LED display wall that you can control by sending IPv6 ICMP echo request messages, more commonly known as pings. Reading the page, you quickly parse the fact that there are three ways to control the tree. First, you can type a message in the box and press send – this message gets displayed on the crawl at the bottom of the LED screen. Second, you can light up the tree by sending a ping to the IPv6 address 2001:4c08:2028:2019::RR:GG:BB, where RR, GG, and BB are 8-bit hex values for red, green, and blue. This is a neat abuse of the IPv6 address space, in that the tree has 224 (around 16.8 million) IPv6 addresses, one for each color you can set. We were impressed by this brute-force use of address space, at least until we read on a little further. You can also make your own drawings on the LED wall, again by sending pings. In this case, the address to set a pixel to a particular color is: 2001:4c08:2028:X:Y:RR:GG:BB, where X and Y are the pixel coordinates. This seems easy enough: to set pixel (10, 11) to magenta, the RGB value (0xFF, 0x00, 0xFF), you’d simply ping the IPv6 address 2001:4c08:2028:10:11:FF:00:FF. Having an array of addressable LEDs is commonplace in hacker circles today, although each of them having their own live IPv6 address on the Internet seems a little excessive at first. Then it hits you – each LED has an IPv6 address for every possible color, just like the tree: 16.8 million addresses for each LED. The LED display is 160×120 pixels in size, so the total number of IPv6 addresses used is 160x120x224, which is 75 times larger than all possible IPv4 addresses! This is a hack of monstrous proportions, and we love it. In case you’re not running IPv6 yet, we’ve got you covered. To send individual pings using your browser, you can use a site like Ipv6now. If you want to send pixels to the display wall, you’re better off using a 6in4 tunnel that lets you access IPv6 sites using your current IPv4 connectivity. Hurricane Electric offers a free 6in4 tunnel service that we’ve found useful. Then it’s just a matter of writing some code to send pixel values as pings. The python scapy module is perfect for this sort of thing. But, first you’ll have to fill out the form on jinglepings.com and wait to get your IPv6 address whitelisted before you can draw on the display; evidently the usual bad actors have found the site and started drawing inappropriate things. If you think this use of addresses seems wasteful, you needn’t worry. There are around 3.4×1038 IPv6 addresses, enough for 1027 such displays. We’re going to go out on a limb here and say it: nobody will ever need more than 2128 IP addresses. If you’re looking to build an LED holiday display on a smaller budget, check out this one that re-purposes normal LED strings. Thanks to [Ward] for the tip! By now, most of us know the perks of using a VPN: they make private one’s online activity (at least from your ISP’s point of view, probably), and they can also make it appear as if you are in a different locale than you physically are. This is especially important for trying to watch events such as the Olympics which might air different things at different times in different countries. It’s also starting to be an issue with services like Netflix which allow content in some areas but not others. Obviously this creates issues for Netflix as a company, and indeed a number of services (like craigslist, for example) are starting to block access to their sites if they detect that a VPN is being used. Of course, this only leads to an arms race of VPNs being blocked, and them finding ways around the obstacles, and on and on. If only IPv6 was finally implemented, we might have a solution for all of these issues. [Mariano] owns a late 90’s Jeep Wrangler, and had no idea just how easy it was to steal. Unfortunately for him, the guy who made off with his Jeep was well aware of the car’s vulnerabilities. The problem lies in the ignition – it can be broken out with a screwdriver, after which, the car can be started with a single finger. How’s that for security? [Mariano] decided that he would take matters into his own hands and add a remote-controlled switch to his car in order to encourage the next would-be thief to move on to an easier target. He describes his creation as a “remote kill” switch, though it’s more of a “remote enable” switch, enabling the engine when he wants to start the car rather than killing it on command. The switch system is made up of two pieces – a server inside the car’s engine bay, and a remote key fob. The server and the fob speak to one another using IPv6 over 802.15.4 (the same standard used by ZigBee modules). 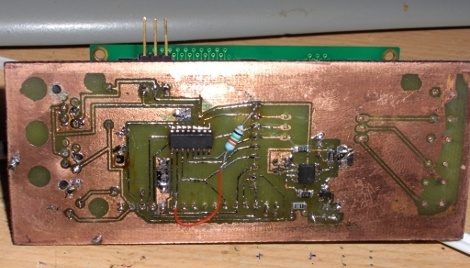 Once the server receives a GET request from the key fob, it authenticates the user with a 128-bit AES challenge/response session, allowing the car to be started. 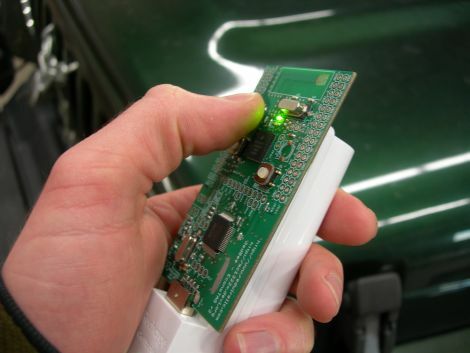 It is not the simplest way of adding a remote-kill switch to a car, but we like it. Unless the next potential car thief digs under the hood for a while, we’re pretty sure [Mariano’s] car will be safe for quite some time. [Viktor], one of our favorite avid hackers, has been playing around with 1-wire systems all this month. What started out as a MicroLAN Fonera has turned into an iButton interface, to a 1-wire powered hub, and finally a 1-wire character driven LCD. Anyone looking at 1-wire systems or OWFS could surely benefit from his testing. However, if you still haven’t gotten your fill of 1-wire goodness, let us remind you of the 1-wire HVAC and IPv6 to 1-wire protocol translator.